Took a day off yesterday and visited a museum in Berlin. That didn't work out so awesomely as it turns out I need far more time than the average human (like Camila, although I wouldn't call her average in most regards). So I had only seen the special exhibition and a part of the Islamic stuff before being kicked out as the day was over. 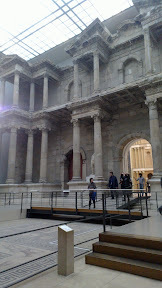 The biggest thing I missed was the awesome ancient Greek section which had the 'big things' (see pic below). I was chased through the section on my way to the exit and I must say that it was truly impressive. I'll be going back to that museum. 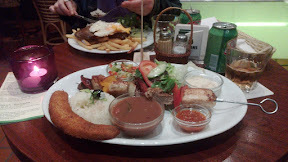 Afterwards we went to have 'Brazilian' food in Cafe de Brasil. The food was OK - what I had wasn't great (come on, 'Churrasco'? That?) but Camila's dish was quite authentic. She said she's bringing cookies, let's see if those are popcorn-cookies or Camila/Jos cookies... In any case, I'll be cooking. 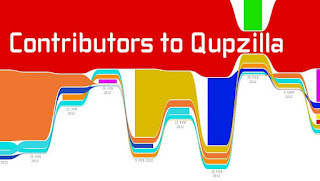 Christopher Wickert pointed me to web browser Qupzilla. 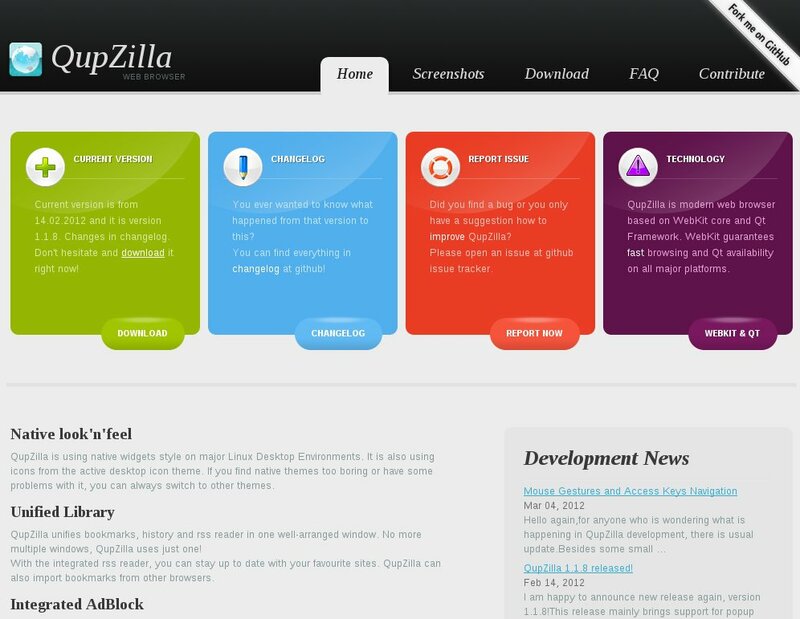 Qupzilla mimics the Mozilla Firefox UI closely but is build on WebKit and Qt. This project was started about a year ago by a Czech student named David Rosca. So you expect an incomplete browser. And you're wrong. Qupzilla has all the features you'd expect from a modern browser while being fast and stable. It has a pretty website. That's advertisement! The site makes it easy to find the important stuff. It is easy to contribute and that fact is advertised with the awesome "Fork me on GitHub" ribbon and the prominent 'contribute' button. GitHub is awesome but people have to find the repo! Has good documentation. Both on how to contribute and how to use. Communicates what is going on! It gets people engaged, makes them care. And thus more likely to contribute. 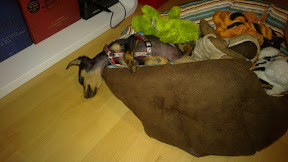 One blog a month sounds like little but it's enough to keep some live in there. Has an easy and pretty download page, using the Open Build Service for multi-distro support and since today using the OBS download integration. Result: the GitHub repo mentions 14 contributors, showing a nice graph of the growth. 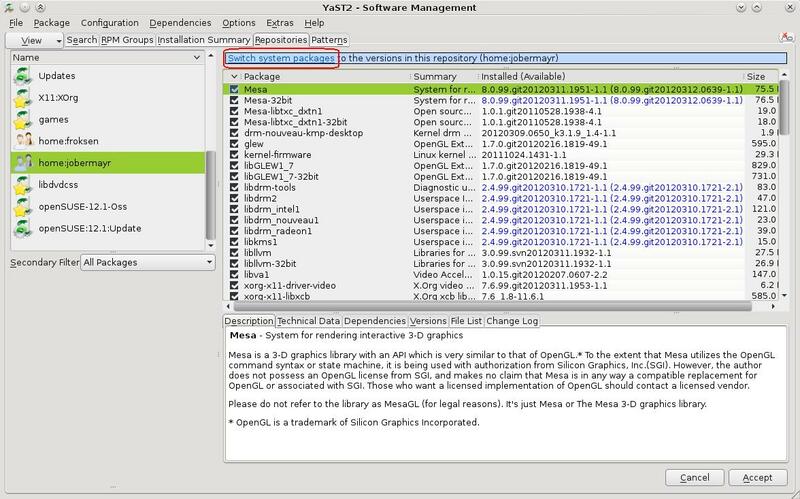 On a different note, the package of Qupzilla has become part of the X11:QtDesktop project, where Petr Vanek and Eugene Pivnev are building Razor-Qt, the Qt based Desktop Environment. As devel project they're open to merge requests (github style, as OBS works that way too) or of course new team members. And they are aiming to Factory and thus openSUSE 12.2 inclusion soon! As Petr, Eugene and David are all Czech FOSS developers I'd like to remind them that there are two conferences taking place within a reasonable distance of their beloved country: openSUSE Conference will take place in October in Prague this year and KDE's Akademy conference will happen from 30th June to the 6th of July 2012 in Tallinn, Estonia. KDE, as biggest community of Qt users, and openSUSE, as most important KDE distribution, would both welcome you very much! I can guarantee that as I'm involved with both conferences. I can also guarantee lots of fun and interesting people at both conferences! Once upon a time at Latinoware 2011... from Tupi: 2D Magic on Vimeo. 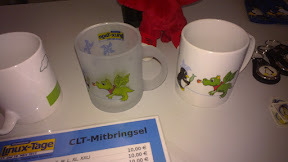 The tupi author would like to visit the Libre Graphics Meeting 2012 in Vienna. Turns out the trip is a tad too expensive so a Pledgy has been set up to help out! So if you know Tupi, want to play with it, and want it to be successful: go here and donate! Am at Chemnitzer Linuxtage this weekend. It is quite a nice event - they take very good care of the booth people with free food and a party on Saturday night and the event has a pretty big number of visitors. Funny artwork, too - it feels very well organized. The openSUSE booth had about 8 people and was in front of the Oyranos booth where Kai explained the usage and usefulness of Oyranos and Color Management in general to visitors. We were joined by Klaas Freitag who brought some ownCLoud materials including stickers and flyers (but no poster! booohoo!). 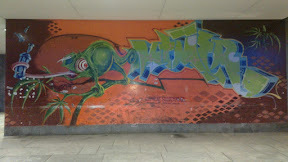 Wicked Geeko, found in Chemnitz on a wall! I worked a bit on some artwork to tell people we've got free beer (for a small 1 Euro donation to Chemnitzer Linuxtage) and otherwise hung out with various people and talked to visitors at the booth. Lots of people like the geeko and want t-shirts, posters, stickers and more. The brochures with the "what's cool about openSUSE" information works, good way to start a conversation. The beer poster is still crazy popular. And so is the beer, we brought 6 crates or so and were out half the day... Need to make more! Edit2: Another thing - quite a number o the translations of the Brochure were done by a number of helpful translators, but they now need to be inserted in the Brochure. Unfortunately that is extremely hard to do if you don't speak the language... If you want to help, see this mail!. 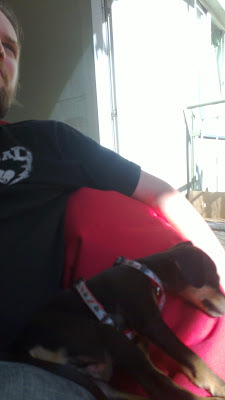 In my previous blog, I mentioned that I was finally free of proprietary drivers. But that story wasn't completely over. While basic 3D acceleration and things like glxgears worked fine, wine did not run Windows games yet. So here's a report on the progress since then and some tips on how to get these things to work! Anyway, let's move to some (Wine) Proprietary-Gaming-on-Linux tips you'd need. Both with and without Nouveau, by the way. Return to Castle Wolfenstein on Linux. You want sound? And you have a modern Linux? Your game depends on an ancient sound driver system called oss... You need to install the alsa-oss layer and make sure you have the kernel stuff loaded for oss. Oh and you can forget about running both a music player and RTCW or another game which requires this compatibility, won't work. It is one or the other! update: I didn't know about aoss which provides an even better solution for the sound. It is simple: start et with "aoss et.x86" and that should already take care of it... It mixes now with other sound as well so you can play music while you frag away. Read more here. Does the game work with Nouveau? Sure, but I experience occasional instability, as in - hard freezes of the system. I recommend enabling the sysrq keys and using REISUB to avoid data loss. I'll be waiting a bit until it is all more stable until I play that game more. I'm going to assume you managed to purge the proprietary NVidia driver from your system (yes, this can be quite hard actually) and have nouveau installed and working already. That gives you 3D effects with Compiz/GNOME Shell/KWin/etc and some other basic openGL stuff. Not enough for windows games in wine, however. 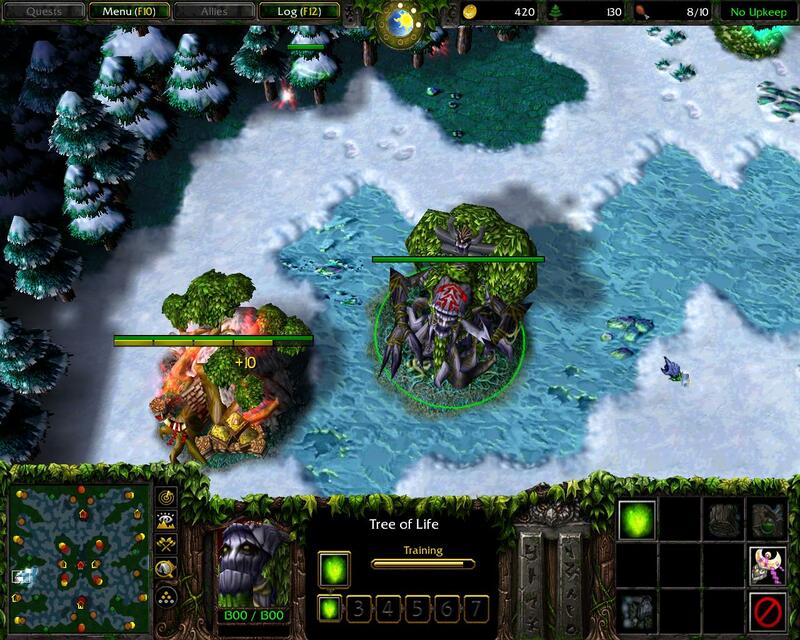 I wanted to play Warcraft III and it took me forever to get that working. Turns out error messages like "Can't load Data.dll" or Put the DVD in the drive have little to do with the actual problem. Most of the problems turned out to be related to missing openGL stuff. I had to install the experimental Mesa drivers developed & maintained by Johannes Obermayr in his home project. You should be able to download his Mesa here (although at the time of writing there was a problem with OBS and it gave an error). You will also need some other packages so I suggest to switch the systempackages to those from his repository (see screenshot). PlayOnLinux and winetricks both have this as options you can enable via their GUI's. It is all rather painful but in the end it's possible to get nouveau to work with Wine (and other) games. But I don't recommend moving over to nouveau if you play games and if you're not desperate to get rid of proprietary drivers (and you usually only are if you want a newer kernel for its hardware support or greatly care about that Freedom stuff). It's not completely ready yet and will give you some issues. In the Prague office 2 weeks ago I saw our big touch schreen computers. These have NVIDIA video cards, and no proprietary drivers - yet they run composited desktops just fine. As my last attempt at having a composited desktop with nouveau failed I was afraid to try again and I must admit that it took me until 3 at night. I messed up my install quite a bit, it seems. But once done - it works! I can even play RTCW, but Warcraft III refuses to work with an error ("could not open Game.dll") which according to the interwebs is most likely graphics related. I hope I can fix that one day - but for now, I can live without games (almost never play 'em anyway) and I'm quite happy with my proprietary-driver-free system!